Camilla Whitehill's longform monologue stars Alistair Donegan as Adam, a newly single man who confides in an unseen companion about his relationship with ex-girlfriend Holly. The play tackles a number of major societal issues including attitudes towards women in the workplace, modern relationships, and several other topical elements which come to light in extraordinary ways as the plot develops. The play begins with Adam throwing up onto a houseplant, before settling down at an office desk with a meal deal lunch and telling the story of his lost love to the unseen and unidentified peer, who is apparently sitting across from him. The show's nuanced subtlety is a rare treat amongst the myriad of one man shows on offer today. Donegan plays the slightly slimy but mostly likeable Adam as mopey but pally, chary but charismatic. His undefinable character is what makes him such an interesting lead. The theme of secrecy and miscommunication is utilised extraordinarily well in Mr Incredible. There is a moment near the end of the play when the audience becomes privy to some new and shocking information, and the atmosphere completely shifts. It is a moment of pure, gobsmacking, instantaneous realisation, in which all of the play's events suddenly make sense. The slow burning plot explodes in an instant, and both actor and audience are left totally exposed. However, the slow pace does occasionally work against the piece, which relies on sustained suspense to enable a satisfyingly dramatic finale. That being said, the bombshell dropped near the very end of the play makes up for the slightly plodding expositional scenes. 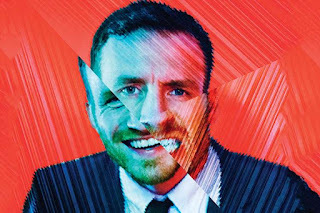 Mr Incredible is a clever, unpredictable and supremely well acted one man play, with sharp writing and enough twists and turns to keep the audience in the dark for pretty much the whole runtime. Catch Mr Incredible at Underbelly, Cowgate, every day at 4:40pm until August 28th.